Istituto Venezia reserved for its students some Opera tickets for Theatre La Fenice at a very convenient price (30 euro or 25 euro, depending on the show). When you enrol, you may want to send us an e-mail to inquire about availability. La traviata by G. Verdi, 30th January 2019 und 3rd April 2019> SOLD OUT! Il Re Pastore by W.A. Mozart, 27th February 2019 > SOLD OUT! L'italiana in algeri by G. Rossini, 5th March 2019> SOLD OUT! Otello by G. Verdi, 26th March 2019> SOLD OUT! Turandot by G. Puccini, 21th May 2019> SOLD OUT! Aida by G. Verdi, 28th May 2019> SOLD OUT! Please write to info@istitutovenezia.com to receive more detailed information on available tickets. The course Andiamo all’opera is available to our students thanks to the collaboration with Venice Music Academy. 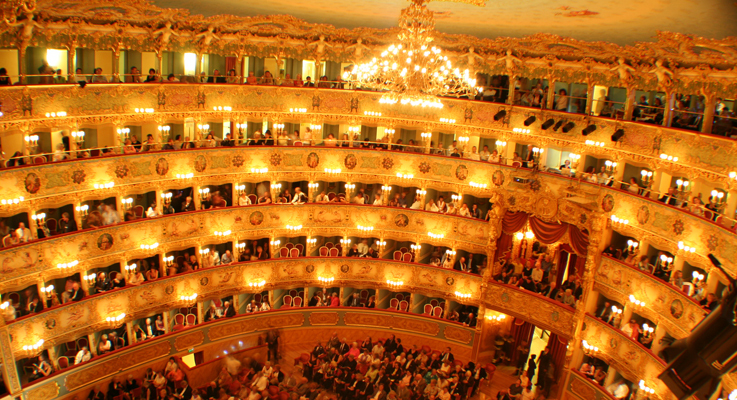 Each lesson will allow you to experience the musical and literary elements of each show that you will attend at the Teatro La Fenice or the Teatro Malibran. Each lesson will allow you to better understand the treasures that Italy, and Venice in particular, can offer: the melodramma. Having acquired an understanding of these elements, the enjoyment that comes from listening to a work will no longer be a privilege for the few, but, you will have a memory that will live with you forever from this unique experience. The course includes a two-hour lesson for each show of the operatic billboard that students will attend with the help of professionals and audio and video support. The course is held in Italian and is designed to be taught in Italian. Depending on student demands the course could also be taught English. In any case, it would not be a problem, to do it in English. Istituto Venezia, in collaboration with the Venice Music Academy, organizes and presents music courses. The courses are divided into various types and experience levels. Lessons are designed in a range from beginners or amateurs to lessons specifically designed for academic students at or for the professional level. Following our proposal of courses that will meet also those who have special needs in order to allow all the success of the lessons. All course can be available upon request. Classes are held in the afternoon and during the weekend and include a number of meetings ranging from one to five per week depending on the needs. Each lesson lasts 55 minutes. 3) tandem course: 55 euro per person per lesson (minimum package 5 lessons). Please write to info@istitutovenezia.com to receive more detailed information.